Earlier this year Jacqueline Puchtler contacted the Society suggesting a blue plaque be placed on the first class waiting room at Kettering station in memory of H.E. Bates. Immediately we were eager to discover more when Jaqueline gave her fundraising talk before the Society’s Annual General Meeting. A pleasant evening was spent in the Celebration Suite at Wicksteed Park, which was sponsored by the Wicksteed Charitable Trust. 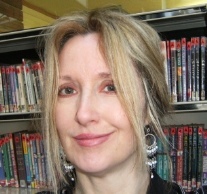 Jacqueline is a Kettering - born author of “The Candle People”, librarian and artist with a first-class degree in the History of Art. 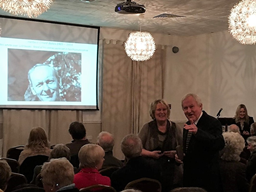 She is an ardent fan of H E Bates and her talk thrilled a large audience of H E Bates fans all keen to see a blue plaque dedicated to him placed at Kettering Railway station. Following a talk by Jaqueline Puchtler on HE Bates and refreshments the Annual General Meeting took place. The election of Officers and Committee took place. Barbara Lewis retired from the Committee, she was an enthusiastic team member and will be greatly missed. The 2016-2017 year has been in three parts, the Civic Scene, the Society’s social life and the range of community involvement and preparation to support the Lottery Bid. The civic scene, through our Society, for the first time has had a base of its own. East Midlands Trains has granted us free use of a station office. The Society’s interests are both historic and current/future which prompted the Society to name the room Time Travellers. Special thanks go to Monica and David for decorating it so creatively. The room was formally opened by Dr Ahmed Muhktar, High Sheriff of Northamptonshire and it has been enthusiastically viewed by many people. Our link with the station grew and the Rotary and the Headlands Residential Group joined us to carry out decorative planting. Mayor, Councillor June Derbyshire opened part of the garden. As the year progressed, a range of Planning/Building sales took our interest. Re-developing the empty properties adjacent to Wilkinson’s, in Newland Street, became a topic of contention. Plans were submitted to rebuild the now aging shops and 32 flats. Objections were partly effective; re-using and clearing land at the rear of the shops would help the town scene and eventually the Planners accepted a scheme of 28 flats. At the same time, Planning Approval to change the use of Mr Ray’s shop on the Market Place to a restaurant as an addition to the ‘Restaurant Quarter’, on the ground floor and a cinema above it. The property sold and Mr Ray retired. The vacant land at the end of Eden Street, partly behind Coleman’s shop is being developed now, and a further Planning Application made for a small flat development. The Government plan to dramatically increase the House Building Programme which affected Polwell Lane bordering onto the back of Wicksteed Park is nearing completion to be followed by the first part of the residential building off Warkton Lane. The Society was approached to suggest street names for this and we have aimed to link ‘old Kettering’ with the new outskirts by recommending names from old family businesses and shops that were in the town centre. Development proposals moved on and the Society was asked by the Gypsy Lane Residents Group to join in the discussions over submitted plans to develop the land between the A14 and Gypsy Lane. Building will inevitably happen and part of our contribution was to propose a roundabout serving Gypsy Lane, the Crematorium, Rothwell and Loddington Road. The roundabout at the bottom of Northampton Road has proved successful. The Northampton Road/Sheep Street changes were reviewed regarding traffic flow and it was considered that the traffic lights be removed and the road improved. Early complaints have been forgotten now that the improvements have settled down. Rewards have been considered important and to this end a Blue Plaque has been made for the Great Meeting of free church/congregational worshippers from Toller United Reform Church. Katie Boyce was rewarded with a Rose Bowl presentation for the high quality of art displays in the art gallery. The Gallery is special to the town. Some old historic buildings are occasionally brought to our attention. This included the old Strict Methodist Chapel in Bath Road currently owned by Timsons who applied to the Council to demolish it. It had not been used as a church for over 50 years and is in a bad state of condition. So far, we have not provided any help. We have also not joined in the plans to re-develop the Poppies Football Ground. Our Mosaic Planning Approval lasting three years ran out last Autumn. We re-applied and it was regranted and is an important part of our National Lottery Plan. Plans to re-develop SATRA’s land and buildings had been submitted to the Council for Approval. The scheme was to include clearing and re-developing the whole site. We objected to the loss of the old house and its landscape. McCarthy & Stone, the Developers, have already successfully completed two developments in the town and they would be welcome with an alternative scheme here in Rockingham Road. The most important building now under consideration is the Royal Hotel which had been put up for auction. There was no sale and other options are being explored. The Society has been in discussion with the Council in the hope of finding a distinguished owner who could make the building a crown in the Market Area. The Society’s social life continues to be a success partly in connection with fundraising. For the third year, a four day break last year to the Liverpool area proved to be an enjoyable success thanks to Phil Evans. Community involvement whilst good for letting the town know we’re here, at this time is very important in our Lottery bid which is about to be re-made. Community involvement is crucial. In this connection, help and support from the Wicksteed Park Charitable Trust is very valuable and we thank the Park for this. Again, Monica has worked closely with them and tonight’s Annual General Meeting is being held here thanks to their generosity. This Report would not be complete without thanking our Committee; Erika Beecher, Sandra Clipstone, Philip Evans, Barbara Lewis, Eleanor Patrick, Andrea Pettingale, David Rose and Karen Davies a welcome new member. Karen has taken over the Treasurer’s role. Again, we thank all our members for their support and especially Monica whose endless effort has created much success. Once again, we are grateful to Wicksteed Charitable Trust for hosting our Annual General Meeting and we reflect on last year when Ian Addis kindly shared his memories of J.L. Carr to an enthusiastic fullhouse. This year we welcome Jaqueline Puchtler as our speaker on H.E. Bates. 2016 was exceptionally exciting with a full and interesting calendar. Long-standing contacts were maintained and new contacts made when the Society received huge community support in a variety of ways. We continue our close link with The Friends of the Alfred East Art Gallery and Museum sharing a stall at Kettering Carnival on a rather cold and stormy day. On 17th May 2017 The Friends will be hosting a talk “When the Railway Came to Kettering” to coincide with our celebrations surrounding the opening of Kettering station 160 years ago. In December Committee members decorated a Christmas tree which was exhibited along with other community groups trees at Wicksteed Park at the Enchanted Illuminations event. We have kept members and friends updated via newsletters, BBC Radio Northampton, the local press, 4Locals, Village Connect, our website and Facebook. 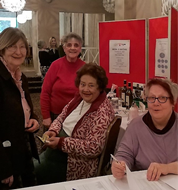 We exhibited in Kettering Museum’s Community Corner and have given talks about the Society to Rotary groups, and Pensioners Parliament. The Society has maintained a physical presence in the town through Toller Church Coffee Mornings, and through a variety of activities in Time Travellers. During September, with thanks to volunteers, we were able to keep Time Travellers open most days when we exhibited Jamie Poole’s art and Susie Corke’s award winning quilts in the Northamptonshire Open Studios Trail. Our links continue with the Prince’s Trust and we attended an award ceremony at the Roundhouse in Derby on 9th November 2016 when each young person was nominated for Celebrate Success with a unique story. All the young people on Kettering Team 43 had experienced multiple barriers to success; failure at school lacking in motivation or having a sense of purpose in their lives. Some had turned to drink and drugs to cope with their problems, some had been involved in offending behaviour. As part of The Prince’s Trust Team Programme, they chose Kettering railway station to make it more attractive and accessible and improve the image of their town for visitors arriving at the station. This decision was motivated by their determination to give something back to their community in order to counter the negative stereotyping of young people. They raised funds and negotiated roles, working outside through cold, wet and frosty weather. The course helped to make them into a strong, motivated unit, capable of achieving their goal. After the project every member of the team moved on to a job, a college course or voluntary work. We attended East Midlands Trains conference for station volunteers which was held at Derby Football Stadium, an interesting and worthwhile experience. Our close contact continues between East Midlands Trains and Rail Network. In 2016 fundraising for the Mosaic was at the top of our agenda and the year began with a successful fashion show, curtesy of M & Co. The Star Inn in Geddington hosted a quiz on the Society’s behalf. We held two ambitious grand prize draws when local businesses generously donated prizes. 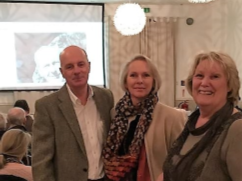 In November, our webmaster Roger and Penny Payne treated us to a wonderful multi-media quiz which took place at the Police Social Club, this was well attended and enjoyed by all. The Gold, Silver and Bronze sponsorship opportunities initiated generous donations towards the Kenneth Budd Mosaic and we hope they will continue to bring in funding. Alongside fundraising for the Mosaic, work continued on the Heritage Lottery Bid. Many meetings took place and advice sought. It is not a simple matter of form filling but a complicated process of engaging with a variety of community groups who make a commitment to participate in activities. Costing and quotations are required. For every statement made, (3,000 words plus a project timetable plan) evidence and supporting letters are needed, and compiling this has taken yet another year. Planning Application for the Mosaic, to be placed on the Newlands Centre, had expired and permission was once again applied for and approval was granted. Another bid should be submitted in 2017. We have been simultaneously making enquiries to the Andrew Lloyd Webber Foundation for a Grant. In order to carry out the Society’s aims and existence, now more than ever, we must continue with fundraising and to that end we have created an opportunity for members to join the100 club. Gift in Wills is another opportunity for donating to the Society. The two charity dinners; one Ascot themed and the other celebrating Kettering Grammar School Sputnik tracking took place at Kettering Park Hotel, who offered us a generous package, were both very special in their own way thanks to all those involved in creating very happy memories and further boosting our coffers. The speakers, Adrian McGinn and Isobel Carmichael were inspiring and the auction carried out by Richard Barnwell was most entertaining. The Society very much relies on a computer to carry out the day to day work and when our old computer failed we were delighted that Councillor Russell Roberts agreed to fund a new computer for the Society through his “Empowering Fund”. Due to a heavy work load in 2016 we did not have the time to organise our annual trip to the Proms or other day trips, however, we did enjoy another four-day coach trip to North Wales which was a huge success. I would like to thank all, too numerous to name individually, who took the time to support all the many activities and meetings that help the Society to continue with its aims and objectives. We look forward to an even more exciting and eventful 2017. 11 am unveiling of the plaque at Meeting Lane. Kettering Civic Society has placed seven heritage blue plaques around the town. They are dedicated to Sir Alfred East in the garden at Morrisons; William Knibb, Market Street; Charles Wicksteed on his home Bryn Hafod; Frank Bellamy, Bath Road; Tony Ireson, Beech Cottage, Tanners Lane; J. L. Carr, Milldale Road and T.C. Gotch the artist in Lower Street. “Toller United Reformed Church has been part of the history of Non-Conformity in Kettering for over 345 years. 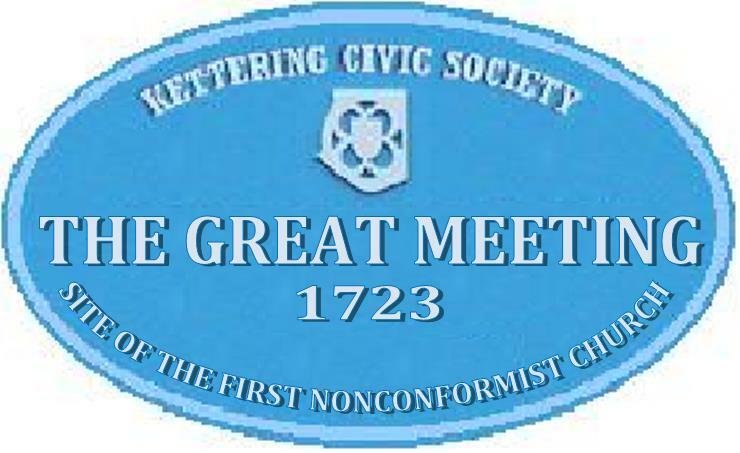 The first non-conformists in Kettering railed round the then Rector of Kettering, the Revd John Maidwell when he resigned his living on the enforcement of the Act of Uniformity in August 1662. Although no worship or preaching was allowed, these early non-conformist Christian believers met secretly in members’ and relative’s houses, mostly at a cottage in Hazelwood Lane. Around 1685 when more freedom was allowed in worship, a converted barn behind High Street was opened for services. Called “The Independent Meeting” and founded on “Congregational” principles the building could hold 400 people. When Revd John Maidwell died in 1693 ironically, he was buried in the chancel of Kettering Parish Church. Among the worshippers were Baptists, Congregationalists and Presbyterians but in 1696, because of their views on baptisms, the Baptists formed their own church (The Little Meeting). The meetings flourished and congregations grew rapidly and in 1723 a new church was built on Bakehouse Hill, now Gold Street. Seating nearly 800 and at a cost of £543 it was then the next in size in Kettering to the Parish Church. In its’ long history the church has had a great variety of names starting with the “Christian Church of Kettering”, “The Independent Meeting House” and “The Great Meeting”. In 1776 a century of ministry under the name of Toller began with the induction of Revd Thomas Northcote Toller, succeeded in 1821 by his son Revd Thomas Toller. The church then became known as “Toller’s Chapel” later “Toller Congregational Church” and now “Toller United Reformed Church”. With the growing number of pupils attending, a new building was erected adjoining the church in 1849. In 1883 the church felt the need for even better facilities and built a new Sunday School in Meeting Lane. In 2006 this building was refurbished and renamed “Toller Meeting Rooms”. In 1898 the structure of the church was drastically altered from a Puritan Meeting House to a Victorian Church, with the addition of towers and vestries. A major step was taken in 1979 when pews were removed and a multi-purpose Church evolved, but the main structure of the first building is still the main part of the Church. In 1972 the amalgamation of the Congregational Church of England and Wales with the English Presbyterian Church brought into being the United Reformed Church. The Church is now known as Toller United Reformed Church. Some text taken from “The Great Meeting” written by Frank Goodman. Recent events compiled by David Pywell of Toller Church. AND SUPPORT YOUR TOWN AT THE SAME TIME!! The object of the 100 Club is to raise funds for BLUE PLAQUES, & FOR THE BENEFIT OF THE TOWN. Refreshments available. Ticket Prices: £4 per person, FREE to Friends Members. No advance booking required. If you shop on the internet please register at our fundraising site A percentage will be donated to the Society at no cost to you. President: Dr J M Freeman OBE Chairman Paul Ansell Dip. Arch RIBA. Secretary Monica Özdemir, Treasurer Karen Davies Committee: Erika Beecher, Sandra Clipstone, Eleanor Patrick, Andrea Pettingale and David Rose.